The first day of spring has sprung and the nights are getting lighter… at last. If your garden is anything like ours it’s definitively in need of some big TLC. On the list are tidying flower beds, sowing seeds for later in the year, mowing/rescuing the lawn and… sorting out the garden furniture. 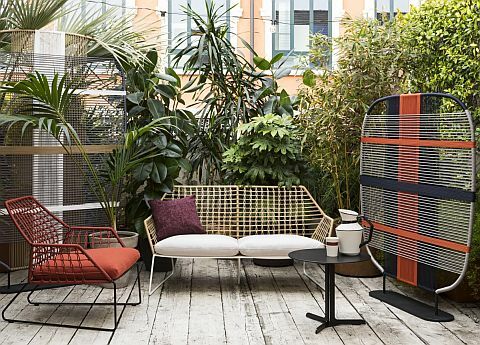 With summer 2019 promising to be another scorcher, we have some fabulous new outdoor designs to help you make the most of it. The traditional seaside deck chair has come along way and is making a big comeback. Forget knotted hankies and rolled up trousers. The latest designs ooze contemporary style. They can also stay outdoors for longer, won’t collapse on you and are luxuriously comfortable as well as easy on the eye. Many have metal frames which are a lot lighter than the old wood variety, and both the fabric and the frames are specially treated for resistance to UV light, stains (here’s looking at you ice-cream) and humidity. Amongst our favourite are these EMU Snooze deckchairs. 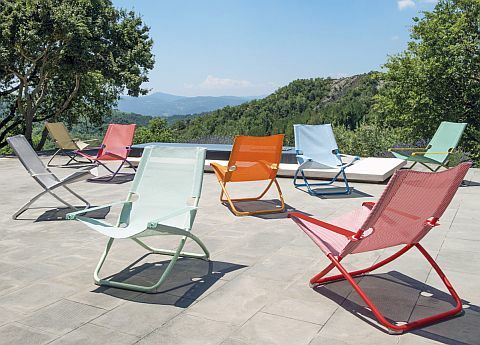 They’re designed by Chiaramonte & Marin for Italian brand EMU, and are just a joy to look at. If your garden flowers aren’t supplying enough colour these certainly will. There are eight different colourways – with juicy combinations including orange/peach, mint green/lemongrass and Indian brown/beige. The fabric is Emu Tex, made to withstand the harshest outdoor elements. The literal translation of chaise longue is ‘long chair’. And that’s exactly what part of the brand new Tribu Senja range is – a beautiful long and elegant day bed for the garden. Designed for those lazy afternoons where all you want to do is lie back with a good book and a glass of something cold. 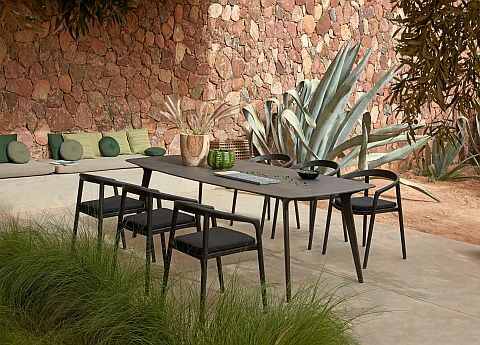 Tribu is one of the world’s leading specialists in outdoor furniture. It was also one of the early pioneers in making the garden and terrace an extension of the living area, and the company is highly regarded for its extensive research and development into the best materials for outdoor use. Along with the highest quality materials is also their excellent ability to translate indoor design to outdoor furniture. The Senja range is a great example of this. Its minimalist good looks, deep comfortable cushions and slimline silhouette hit exactly the current design sweet spot. 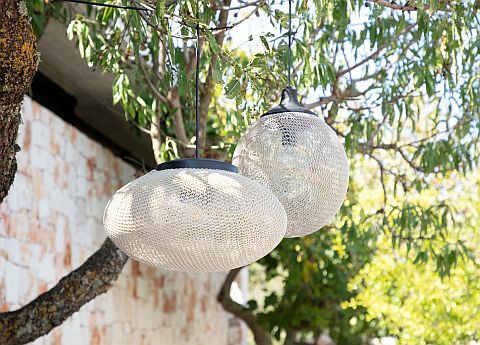 Looking for some truly distinctive garden lighting? It’s here! The new Monsieur Tricot lamps from Tribu, designed by Ilia Eckardt, are not only unique but also highly practical and stylish. 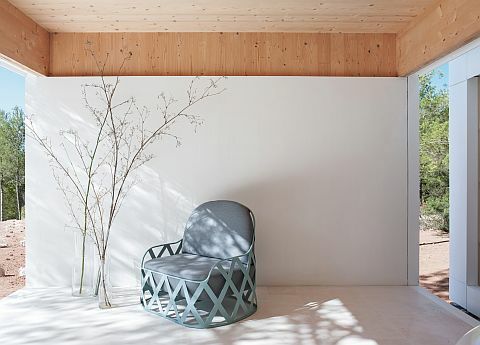 The Monsieur Tricot collection is a tribute to the designer’s mother, Hilde Frunt. Eckardt grew up in their family-owned knitting studio where knitting and creativity was the day to day business. Monsieur Tricot are the world’s first knitted, weatherproof outdoor lights. To achieve the finished result Eckardt used authentic crochet and knitting, including polypropylene cord. This yarn is both weather and extreme temperature resistant. The inner globe part of the lamp is a transparent, weather-resistant thermoplastic, which manufacturers often use as a glass substitute. The pretty shadows and patterns cast by the yarn are sublime and the design is another great example of something that would work equally well inside or out. Zupanc’s other collaborations include distinguished companies such as Moooi, Se and Dior. Since emerging at Milan Design Week she has been closely watched by the industry. Her work has been described as everything from “punk elegance” (Elle USA) and “techno chic” (BusinessWeek) to “larger than life” (Clear magazine). We’ll go along with all of that. The phrase al fresco is borrowed from Italian for “in the cool (air)” (although apparently Italians don’t use that phrase for dining out – in Italian it means “spending time in jail” (who knew?!). Whatever you call it and whether it’s an impromptu picnic or a formal dinner on the terrace on a gloriously warm evening there’s nothing better. Finding the right dining table is key to making it work. Look for designs specially created for outdoor use. Those featuring hard-wearing porcelain tops are some of our best sellers. They’re waterproof, resistant to spills, scratches and abrasions, chemicals and fires. They’re also fade proof as well as extremely strong – in fact practically bomb proof. The Manutti Torsa table (below) is a great example and one of the best designs around. After last year’s glorious summer we’ve seen a big demand in furniture for small patios and roof terraces. Designs suitable for these areas include light, hand-woven materials, which are ‘airy’ in appearance, helping to create a greater sense of space. Large, lumpy furniture simply doesn’t work on a small patio. Colour seems to be important too, maybe because room for growing plants in these areas can be limited. Another great introduction and proving popular are ‘space dividers’ or ‘concealers’ which are fantastic for hiding a less than perfect view, providing privacy, or separating a barbecue area from a seating area, which is useful if you’re transitioning from afternoon lunch to early evening drinks. The Saba Italia range above is ideal for smaller spaces. Designer Marco Zito’s Shades of Venice include bright horizontal and vertical graphic lines to create a peek-a-boo effect, subtly revealing or hiding the spaces beyond. The innovative design features colours from some of the Venetian islands: Murano has the blues and greens of the world famous Murano glass, Burano the colourful oranges and blues of the houses, Giudecca’s white stone, and Sant’Erasmo its abundance of dusty greens, purples and brown vegetables. The pretty New York Soleil furniture by Sergio Bicego is made entirely by hand in inter-woven polyurethane. There are 13 different tones, blends or solid colours for the fabric, which also scores extremely highly on the international Martindale test (guaranteeing excellent abrasion resistance). So, are you ‘garden ready’? We are…. and it’s all there waiting for you. Hop over to our site and take a look at whats new for this season (sun cream not included).